A few days after my post about the insanity of some government workplace “wellness” initiatives I noticed that I was getting a lot of traffic from a subreddit. Out of curiosity (yes, I never learned from the cat’s misfortune) I clicked on the link to see what it was all about. I discovered a whole little world that I never knew existed. Something called “fatlogic”. Maybe I’m out of the loop (it’s been known to happen) but I’d never heard of fatlogic before. As far as I can tell this fatlogic is basically the opposite of HAES (Health at Every Size). People who ascribe to this position seem to think that fat shaming is an acceptable way to “encourage” people to lose weight. It’s not just thin people who think this way, there seem to be a number of people who are overweight, or who were overweight, who are staunchly opposed to the notion that people can be healthy and overweight and believe that insulting people who are overweight (or who advocate for HAES) is appropriate. It was nice of this group to keep their insults to themselves (i.e. voicing them on reddit rather than in the comments on my blog). I was pretty amazed at the vitriol of many of the members of the group. According to them, I clearly had no idea what I was talking about and was a brainwashed moron for believing that weight is not the best indicator of health. The subreddit also went off on a little tangent from what my primary point was. 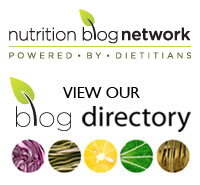 Everyone became fixated on my comments about BMI not being a very good measure of body fat. Herein is one of the clear flaws of their logic. I mean, besides the fact that it’s ignorant and discriminatory. One person mentioned that BMI is a measure of body fat, interpreting that a BMI of 18.5 equates to 18.5% body fat, below which one would be classified as “underweight” according to the BMI. The thing is, BMI doesn’t measure body fat. That 18.5 is not a percent; it’s technically kg/m2. BMI is a body mass index intended to classify people as underweight, normal weight, overweight, and obese based on ranges of this index. Someone with a BMI of 18.5 could have 8% body fat or 30% body fat. This is one of the reasons why BMI is widely considered to be an inaccurate tool for measuring weight (and health). You could be very fit and lean and have the same BMI as someone who leads a sedentary lifestyle and has a significantly higher percentage of body fat. I know that it goes against the basic tenets of the Internet but wouldn’t it be nice if people actually knew what they were talking about before they attacked others? Ever notice how it’s generally those who are the most vocal who know the least? 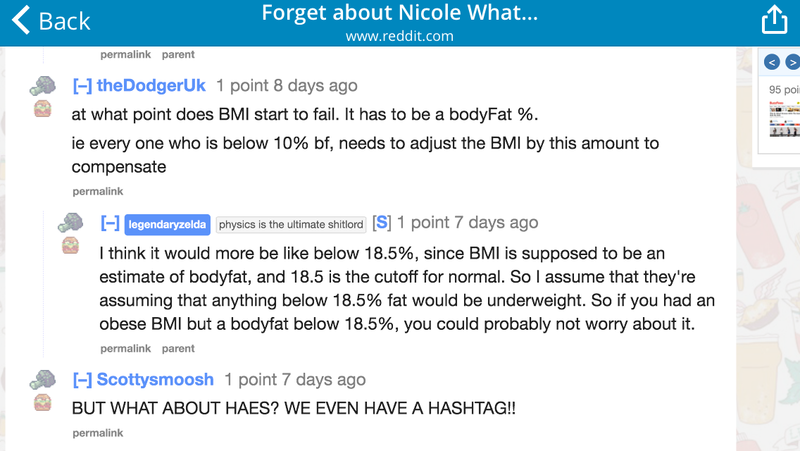 Tags: BMI, body fat, fatlogic, HAES, reddit, subreddit, weight | Permalink. Nutrition discussion boards are a breeding ground for Dunning-Kruger effect.